Sending a little blog love to Sarah Lindahl of So...What Else? Her younger sister Beth and I were besties in high school. Sarah and I have been blog friends since we both started writing a little over three years ago. I have read every single post she's ever written, and I'll read every single post she'll ever write. She's hilarious, she's a teacher, she's snarky and super smart. 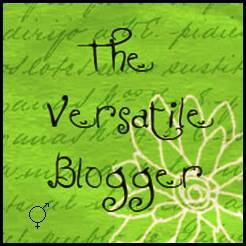 And she awarded me and four others but mostly me The Versatile Blogger award!! This is my favorite post on her blog. No, wait, this is my favorite post. Check out this hilarious series about things her daughter Kira says in the car. She has an unhealthy and possibly romantic obsession with a deceased man. I also like this post a lot. Probably because it's all about me. And this one is fun. (About me, again). Thank you! You are so wonderful.